>Yesterday’s yummy, super-twee (but not in an awful ‘Tweecore’ way) band, The Bumblebees, got me thinking. Actually, they got me a-hankerin’ for some more jangly indie. This hankering intensified when I accidentally subjected myself to a video of the Ting Tings’ awful song Shut Up and Let Me Go this morning. Its ultra-hip, consciously-ironic, sunglasses-indoor idiocy made me feel all hopeless. Where’s the fun, or the the sense of reality in their super-slick, focus-group-defined sound? So Today’s New Band was always going to sound like their music was a) heartfelt, but not sincere; b) enjoyable, but nicely throwaway; and c) both happy and sad. So, say a big ‘hello’ to The Shot Heard Around the World, a band who fulfil those criteria and are as far removed from plastic generic stupidity as possible. They sound like people playing music for the fun of it. LOL!! !, as ‘the kids’ would say. They’re also the second band from Brooklyn to feature on here in a week. Perhaps the A.N.B.A.D. staff are fishing for invites over there or something. Make of that what you will, but one thing you will definitely recognise is a good indie tune when its tinny-guitar-twinkling winds its way into your brain, and the marvellous is, and does, just that. Rough, ready and engaging, its a song full of harmonies and a sprinking of the pleasantly inevitable glockenspiel that makes you feel happy to be alive. Evening Prayer is homely, warm and sorry – “I treated you less than right, girl that’s true/But everything will turn out right… Nothing ever turns out right,” lamenting and apologising. Thinking about it, all of the bands this week so far have been very… human. Celebrate a theme as broad as humanity and listen to The Shot Heard Around the World‘s songs here! Posted on July 30, 2008 by Joe Sparrow. 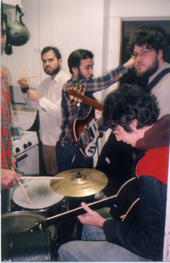 This entry was posted in Today's New Band and tagged chiming, folk you, slightly mournful. Bookmark the permalink.